A low lint automotive wipe specifically designed for finishing. It will not scratch even the newest paint work, making it perfect for polishing, trim cleaning and body and glass wiping. Roll Size: 260mm x 140m. Sheet Size: 26cm x 36cm. 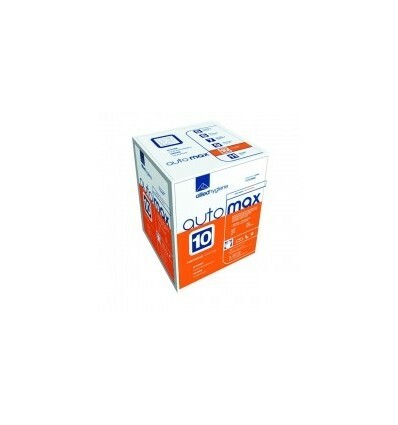 Automax 10 is a low lint wipe that has been specifically designed for finishing, meaning it will not scratch even the newest paintwork. This wipe is ideal for polishing, trim cleaning and body and glass wiping, making it ideal for cleaning parts and polishing interior and exterior automotive bodywork and glazing. 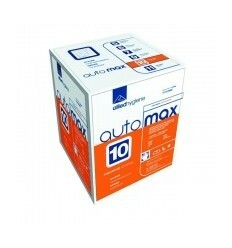 Automax 10 is a boxed wipe which protects the roll against contamination. The roll end exits through an aperture in the top of the box, reducing over use. Designed for Automotive & Refinishing, Engineering, General Housekeeping, Aerospace, Transport, Double Glazing Industries and Furniture Manufacture.